Mr Shah said Mr Naidu’s desperation for grabbing headlines is understandable as he is aware that his political fortunes are declining rapidly. 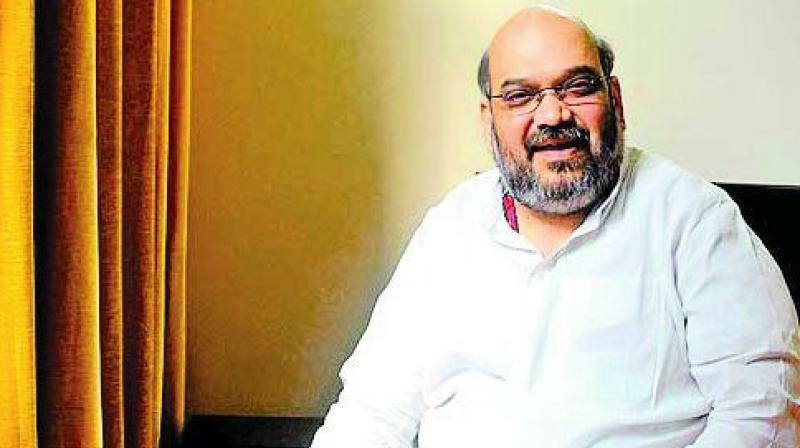 Vijayawada: BJP national president Amit Shah described TD supremo N. Chandrababu Naidu’s fast in Delhi on Monday as “theatrics and histrionics”. In an open letter to the people of AP on Monday, Mr Shah said Mr Naidu’s desperation for grabbing headlines is understandable as he is aware that his political fortunes are declining rapidly. “Naidu knows that he has lost complete credibility among the people of Andhra Pradesh and as a result is announcing a series of sops to woo different sections. Sensing defeat in the coming elections, he has made multiple U-turns and is carrying on a malicious propaganda against the Centre and BJP leadership to divert people’s attention from his failures. He is going too far by personally attacking Prime Minister Narendra Modi, and even did not have the courtesy to receive the Prime Minister when he came to the state,” Mr Shah said in the open letter.